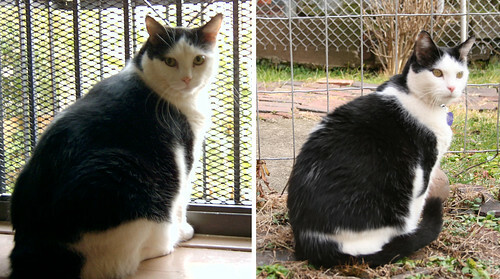 Obese stray cat gets stuck in doggie door. Funny, but not really. It's sad that so many cats, just like humans, are overweight. The OHS said that 40 percent of cats in the United States are considered to be overweight and are being seen more often by veterinarians for various disorders. A press release said cats are at risk for a number of obesity-related disorders and that in recent years feline diabetes mellitus, or diabetes, has become a regular diagnosis in animal hospitals across the United States. That's why we are so proud of Rocky. He's doing great with his diet and has lost 4 pounds over the past 2 years. He eats Science Diet r/d® which definitely helps, but even more important, since we left NYC, he gets a whole lot of exercise. You can see the difference.